on sunday evening we discovered a kitten on the front porch of our house here on avenue c. of course we had no choice but to bring the little thing in and figure out what to do from there. we already have more than enough cats (4) and we are not planning on adding another. I am looking for a good home for this adorable all black kitten. in the meantime, what is one to do? on monday and tuesday ms. t was over and we have a serious case of mutual love taking place. ms. t is working on her parents, but you know those parental units can be tough nuts to crack. her mother and father do love cats. coincidentally, their home recently had a death among their clowder of cats, reducing the number of felines in the family to two. now I don't want to add any pressure, but it sure seems like three cats is an ideal number! until whatever happens happens it looks as if ms t has her a sweet kitten to love and cuddle here on avenue c. incidentally, since the kitten needed a name I did give the honor to ms t she named her lilo sasha - lilo, after a character on one of her favorite disney shows and sasha which is variation of her own name. ray charles (1930-2004) singing don gibson's country classic I can't stop loving you. ray's version of the gibson song propelled the song to the top of the charts back in 1962 and is credited as helping bring country music to the mainstream. according the the portal of all knowledge, " 'I Can't Stop Loving You' topped the Pop chart for five weeks and stayed at #1 R&B for ten weeks in 1962. It also gave Charles his only number one record in the UK"
photos: top - yesterday morning; bottom yesterday afternoon - oh my how can one stop true love? Heh, heh! It looks to me like Ms T's parents don't have a snowball's chance in Cancún of saying no on this one! Thanks for the Ray Charles; it's always good to hear him. And I still say his version of "America the Beautiful" needs to be our national anthem. I swear, she is the cutest child I have ever seen (along with my own of course. smile). But seriously, she is adorable, and yes, the kitten is too. What lovely pictures. I have she gets to keep that lucky kitten! Cute kitten, beautiful child...Ray Charles? Priceless! Aww!! They are both absolutely darling! They are meant for each other! Awww, I think she's destined to live with Ms. T! 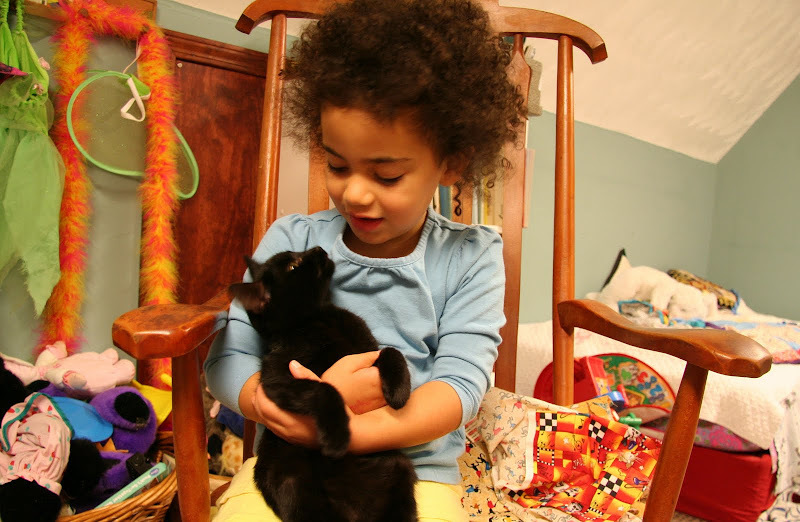 Serious case of mutual love indeed--that is a great pic with the nice eye contact between child & kitten! What a lovely post. And great music as well. I'm thinking that someone must be missing that kitty. It looks so relaxed - not what you'd expect from a stray. But maybe it's just the good vibes at Ave C!!! We had a black cat Teddy that looked just like that! Somehow strays know where it is safe to go. Dogs always find my house. Lucky kitty. Awww... 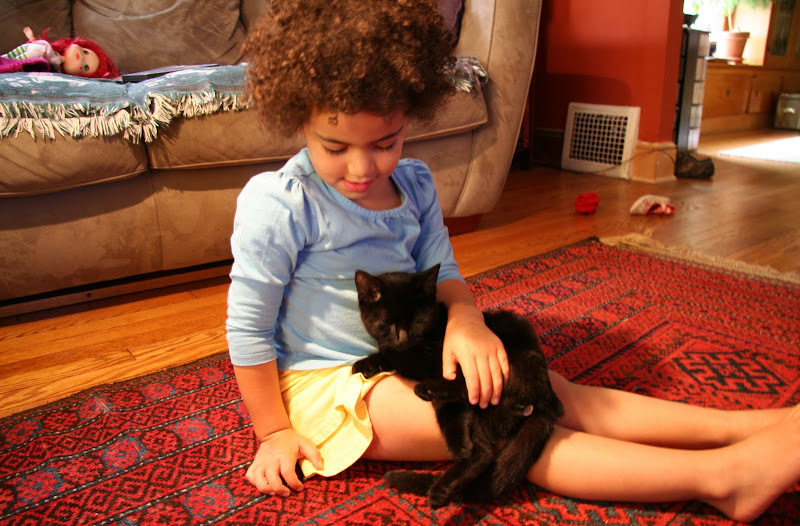 I've been looking to adopt a black kitty just like that! Can't get any more pure in spirit and unconditional love than that! Ms. t has the best hair ever. Wow! And the new kitty is so sweet. Many people tell me that their cats find them, rather than the other way around. Lovely peek into life on Ave. C! Such sweet photos- they're lucky to have each other! it would seem they are meant to be together...too cute. it appears that the bloggyhood is rooting for ms t! ms t and I thank you for your support - we will see, we will see! yes indeed, whats a girl to do?